stripping rights from women | What's that you said? You know what they call a person without rights, or with reduced rights? A slave, a child. This is what a large percentage of particularly white, privileged, entitled people are working on in this country. While the effect will be felt by all women, its burden will fall disproportionately on those that the selfsame rich white entitled hate the most. And without an understanding of the underlying dynamics pinning it, it further fractures women who may all be women but are also either rich or poor, white or non-white, educated or non-educated and so on. Abortion is a particularly nasty pretext for all of this. And it is instructive to see the fury anti-abortionists have brought to bear ever since Roe vs. Wade. 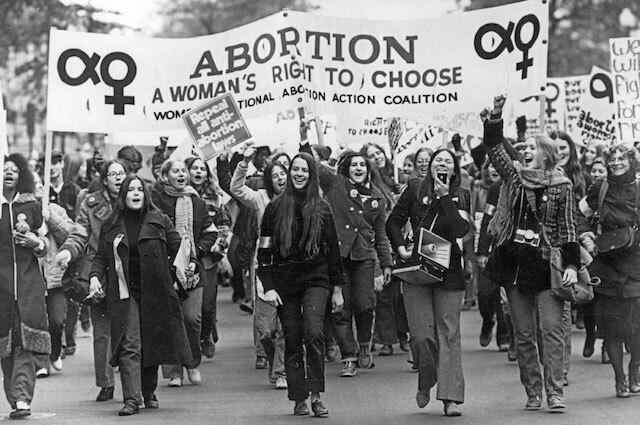 After such victories could no longer be achieved openly in the federal courts, the battle moved to the statehouses, where hundreds upon hundreds of TRAP laws—that stands for Targeted Regulation of Abortion Providers—have been passed, often making debunked or unfounded claims about maternal health and exigent medical necessity. Only rarely and inadvertently is the desired endgame—to shutter clinics, all clinics, forever—acknowledged. Occasionally, someone will make this point out loud. The day after Texas approved its own TRAP law in 2013, then–Lt. Gov. David Dewhurst tweeted a photo of a map that showed all the abortion clinics that would close as a result of the bill, writing, “We fought to pass SB5 thru the Senate last night, & this is why!” But even though most elected officials aren’t as forthright as Dewhurst, shuttering clinics has always been the explicit plan, as Americans United For Life— the organization that designed most of these laws—has expressed openly. “As we’re moving forward at the state level, we end up hollowing out Roe, even without the Supreme Court,” said the former head of the group. “States can’t outlaw abortion. That does not mean there’s a constitutional right to abortion being convenient,” another AUL official said. What the public wants and what the Constitution requires don’t matter to anti-abortion activists—what matters to them is that every clinic that’s shuttered is a win. Will five justices on the current Supreme Court vote to protect Roe? Maybe. Will five justices on the current Supreme Court happily stand back while that precedent is hollowed out by states and lower courts? Very likely. This is the maddening subterfuge women wait out, as men who have promised that they respect precedent decide this week whether they respect it enough to fight for it. Decades of falsehoods from conservative activists and judges are about to pay off. This entry was posted in Fighting Bigotry, Uncategorized and tagged feminism, human rights, reproductive rights, WarOnWomen, yesallwomen. Bookmark the permalink.